Summertime is one of the best times of the year to throw a party, as the warmer weather tends to make a lot of people happier, and it’s easier to socialise and have fun when you’re not inside hiding from the snow and rain. As summer draws closer, those of you who are lucky enough to have a large garden and patio area are probably considering throwing some sort of outdoor party. Whether it be a small barbecue and get together for family and close friends, or you’re planning on using your home as a venue for a larger event, or you’re hiring a venue from Venuesearchlondon.com, here are some top tips for throwing an outdoor summer party that you may like. If you’re inviting a number of people, you might like to send invitations – or you could post it on social media or call them up if that’s easier. Either way, there’s a few things that you should let your guests know when you give them the invitation including when you’re eating and what to wear. If you’re planning on getting the barbecue fired up between 5 and 6pm, make sure that your guests know this so that they won’t be disappointed if they turn up at 7pm, and you’ve got no burgers and sausages left. For the ladies on the guestlist, it’s nice to give them an idea of what the dress code is – sundress and flip flops, casual summer clothes, etc. – although of course, you can also let them know that they can wear whatever they want. If you live in the UK, you’ll know exactly how unpredictable British Summertime weather is, from glorious sunshine one day, to torrential rain the next. Make alternative plans for if it does rain, and let your guests know what your rain plans are. If it’s dry enough you might be able to get away with laying out some picnic blankets, but most guests would probably prefer to have their own chair. If you’ve not got enough patio chairs then you could bring your dining chairs out, or ask your neighbours if they’ve got any outdoor chairs you can borrow. There’s nothing worse than being bitten, so you should get rid of all standing water, keep mosquito and fly spray to hand, and even plug in some fans to get rid of the bugs – they’re weak flyers, so a fan should keep them at bay. Don’t forget to make a playlist and get some speakers, in addition to decorating your garden – simple lighting such as string fairy lights, and some colourful decorations will do to make your garden look colourful and inviting. If there are kids invited, make sure they’re entertained with party games and picnic food. In fact, party games and food will probably keep the adults happy as well, just make sure not to forget the alcohol! 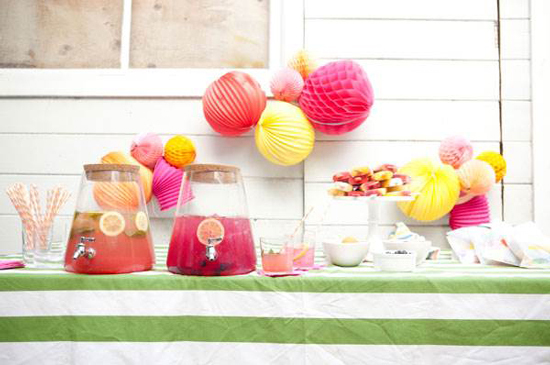 Are you an outdoor summer party pro? If you’ve got any tips, ideas or advice on throwing an amazing party this summer, we’d love to hear from you in the comments.